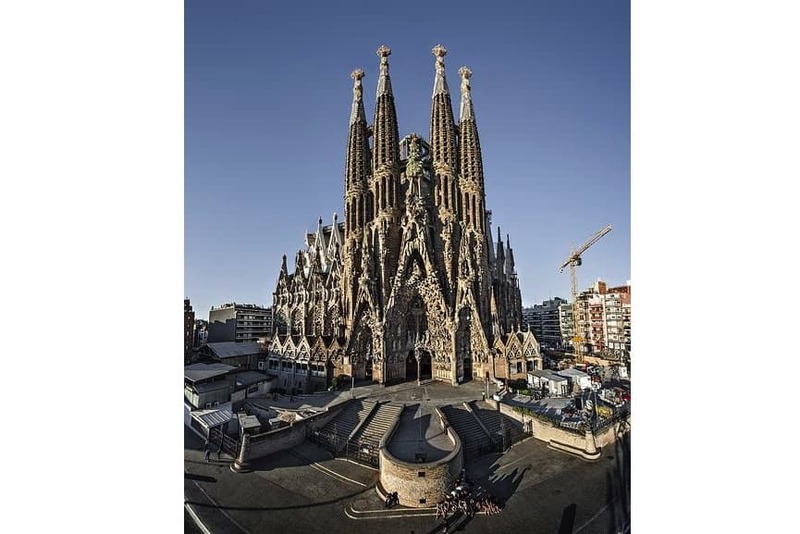 Working at the forefront of Catalan Modernism, the Catalan architect Antoni Gaudí fascinated and inspired generations of architects, designers, and even engineers. 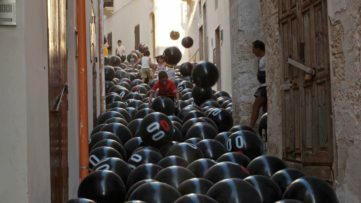 Having a special ability to synthesize the tradition and the courage to new technical solutions, he created some of the most imaginative architectural forms in history, all of them in his native Catalonia. Born on June 25, 1852, in Reus, Spain, Gaudí had a deep appreciation for his native land and great pride in his Mediterranean and Catalan heritage for his art. 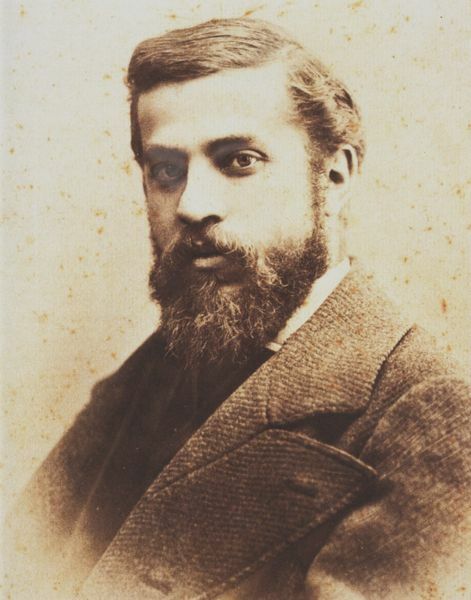 Inventive, daring, and flamboyant, but also highly personal, the Antoni Gaudí work was inspired by his greatest passions in life: architecture, nature and religion. The architect studied organic and anarchic geometric forms of nature thoroughly, searching for a way to give expression to these forms in architecture. A devout Catholic, his buildings contain many references to religious themes, becoming known as the “God’s Architect”. As a great craftsman, he designed all the architectural space filled elements in his buildings, from works from forged iron, furniture and ceramics to sculptures, mosaics and stained glass windows. The Antoni Gaudí architecture brought both constructional and functional innovations, including biomimicry, the use of hyperbolic paraboloid vaults, the use of inverted scale models of the proposed structures, integration of iron and reinforcement of concrete into construction, a way of designing ceramic mosaics from waste pieces, a new technique for stained glass, etc. 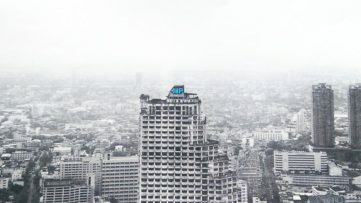 [The architect is] the synthetic man who sees things clearly as a whole before they are done, who situates and connects the elements in their plastic relationship and at the right distance, like their static quality and polychrome sense. From 1914, Gaudí completely devoted himself to his work on Sagrada Família, moving into his workshop inside the basilica. Increasingly leading an ascetic existence towards the end of his life, he stopped shaving and often wore shabby, ragged clothing. On June 7th, 1926, Gaudí was hit by a tram along the Gran Via de les Corts Catalanes. Due to his unkempt appearance, people thought he was a beggar and it took some time before he was taken to the hospital where he got only rudimentary care. He was identified as the famous architect the next day, but it was too late – he died two days later, on June 10th, 1926. Antoni Gaudí was laid to rest in the crypt of the Sagrada Família. 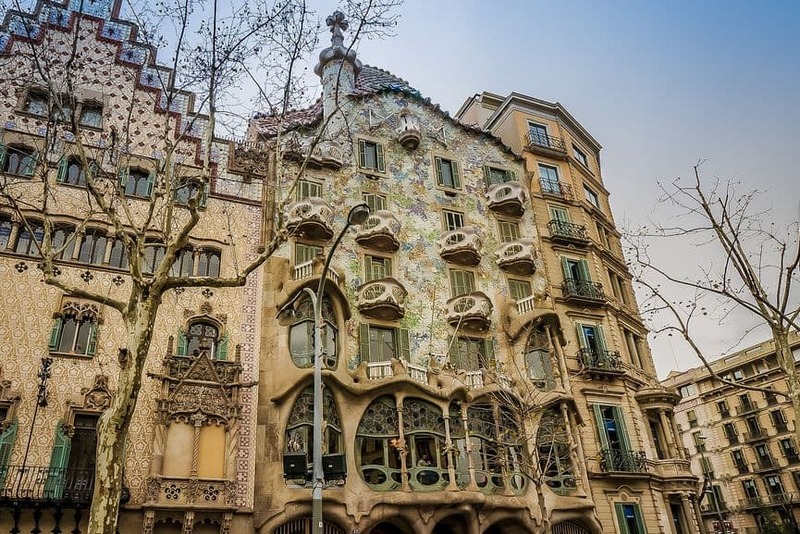 We bring you five Antoni Gaudí buildings which testify to his eclectic and very personal style, which contributed significantly to the development of architecture and building technology. All of these architectural works were declared a World Heritage Site by UNESCO. 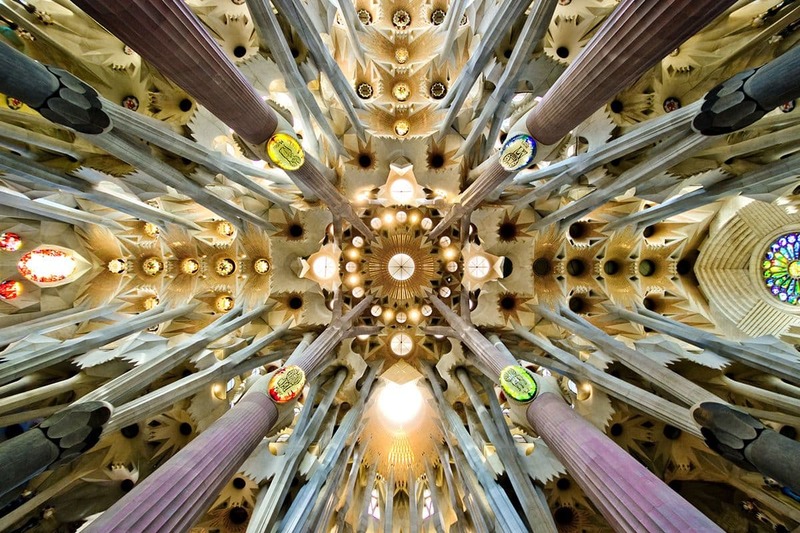 Featured image: The Dome of the Sagrada Família Basilica. All images Creative Commons. 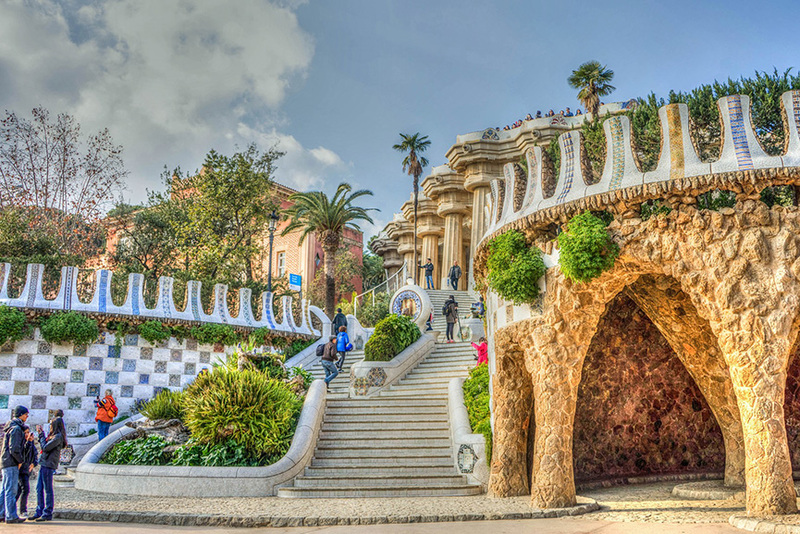 A public park system located on Carmel Hill in Barcelona, Park Güell was built from 1900 to 1914, remaining one of Gaudí’s most colorful and playful works and one of Barcelona’s most famous landmarks. 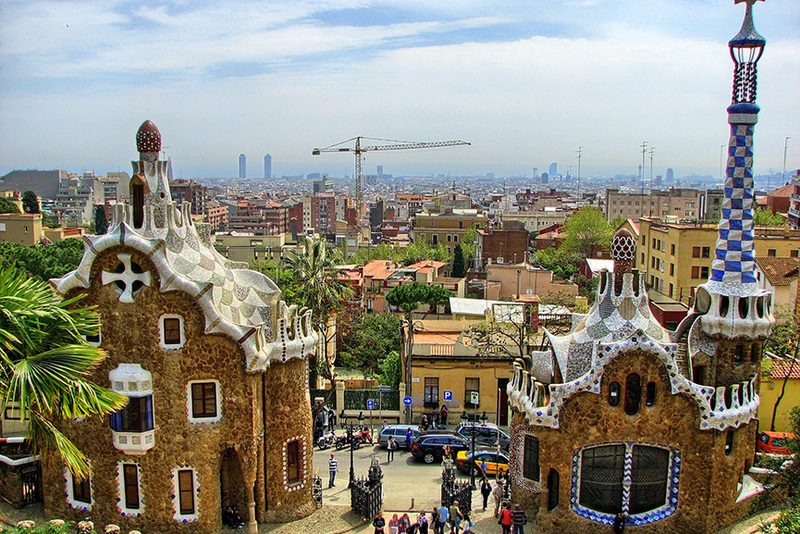 It was designed for Eusebi Güell as a residential park intended for sixty single-family residences, but it was opened as a public park in 1926 despite being unfinished. 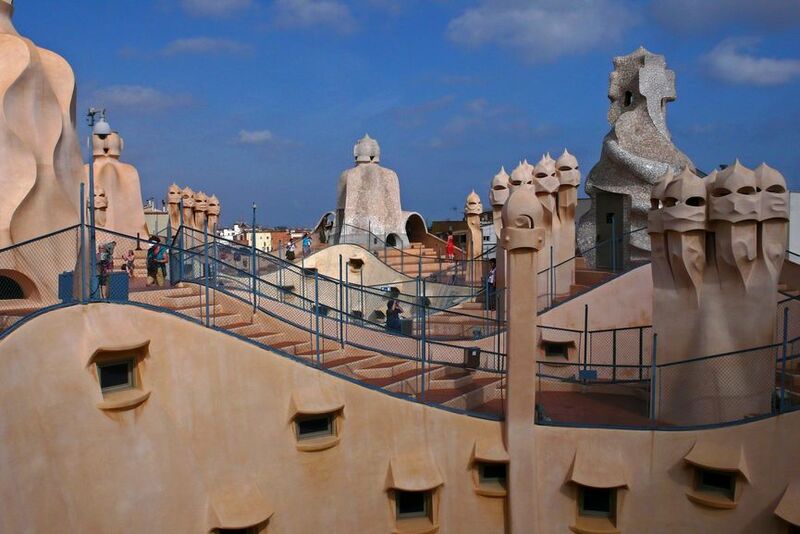 Belonging to Gaudí’s naturalist phase, the design of Park Güell draws from organic shapes in nature. Letting his imagination loose, the architect shaped nature into colonnades, archways and covered galleries with well-camouflaged artificial structures. Acquiring a structural richness of forms and volumes, these designs showcase freedom of the rational rigidity or any sort of classic premises. 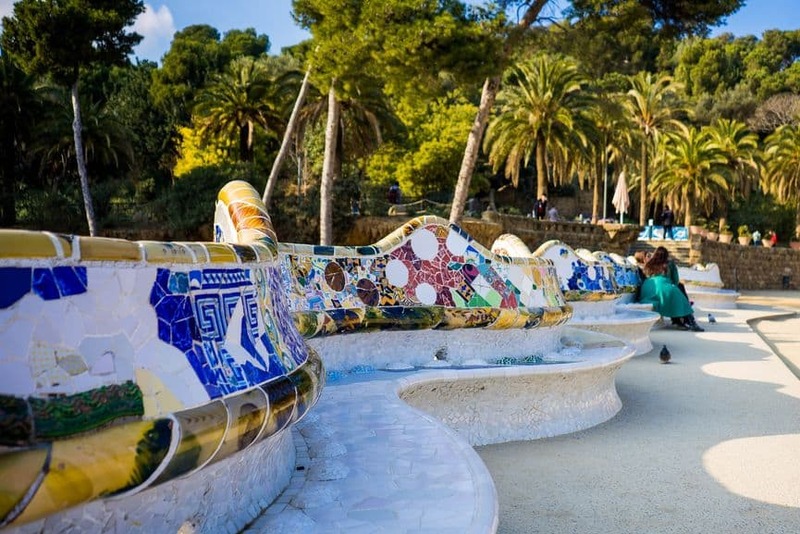 A playground for the mind, Park Güell features columns that stimulate palm-tree trunks, rubble-surfaced arches that grow out of the ground and endless quilts of colorful mosaics. The centerpiece of the work is the intended covered market, with a roof forming a vast terrace surrounded by an undulating continuous bench. 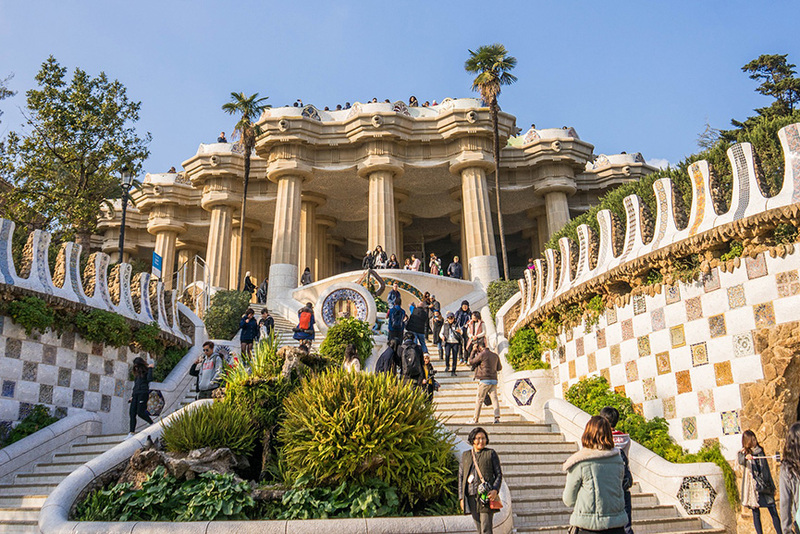 Park Güell is imbued with a complex iconography which draws from a range of references, from political vindication to religious exaltation, passing through mythology, history and philosophy. 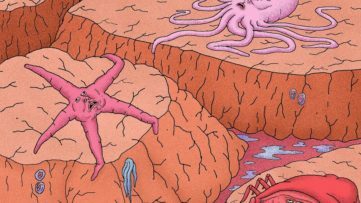 There are many motifs of Catalan nationalism and elements from religious mysticism and ancient poetry. One of the most luxurious buildings in Barcelona, the Güell Palace was commissioned by Eusebi Güell as a family residence as well as a social and cultural venue and a meeting place of the bourgeoisie. It was built between 1886 and 1888 at the zenith of Gaudí’s youthful period, although the decoration would not finish until 1889. The Güell family lived in the house from 1888 until 1945, until the palace was sold to the Provincial government of Barcelona which turned it into the Museum of Scenic Art. A milestone of European architecture in its time, the building is considered one of the pioneering works of the Art Nouveau movements, characterized by an innovative conception of space and light. The mansion was built in stone recovered with marble and decorated with the most delicate furniture and artistic objects. The front gates of the house are made with iron, featuring a parabolic art and intricate patterns of forged ironwork resembling seaweed and in some parts a horsewhip. The luxurious interior includes marble columns, roofs covered with beautiful wood, furniture and marquetry. The mansion is centered around the main room crowned by a parabolic dome adorned with ornate walls and ceilings, meant for entertaining guests. The room also has disguised small viewing windows high on the walls where the owners could sneak peek at their guests from the upper floor. Popularly known as La Pedrera (The Stone Quarry), Casa Milà in Barcelona was the last private residence designed by Gaudí. Commissioned in 1906 by Pere Milà and his wife Roser Segimon, it was completed in 1912, summarizing the stage of maturity of the artist. 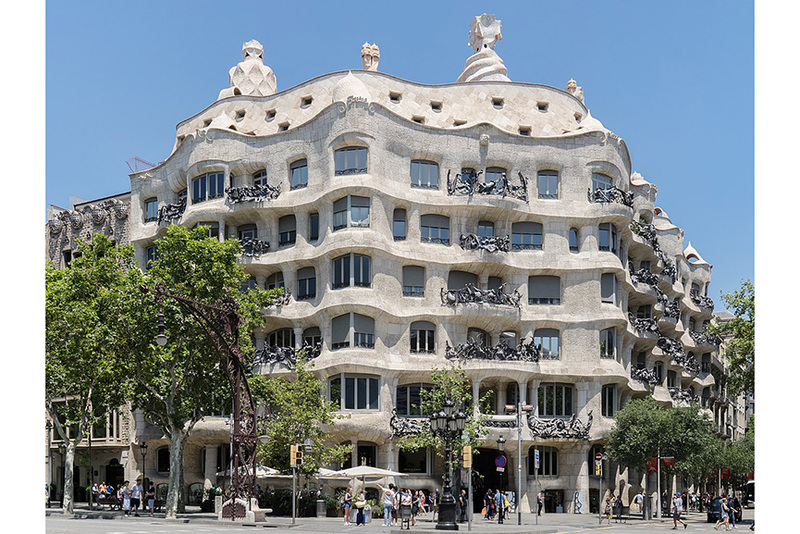 The most innovative Gaudí building, both for structural design and for decorative elements, Casa Milà features an imposing undulating stone facade and twisting wrought iron balconies formed by recycled elements. Among structural innovations are a self-supporting stone façade, and a free-plan floor, underground garage and the spectacular surrealist terrace on the roof. Casa Milà is designed as a constant curve, both outside and inside, incorporating ruled geometry and naturalistic elements. Resolving around two large courtyards, the building is divided into nine levels: basement, ground floor, mezzanine, main floor, four upper floors, and attic. Wanting the people who lived in the flats to all know each other, Gaudí installed elevators on every other floor, so people on different floors would meet one another. One of the most notable elements of Casa Milà is the roof – a famous sculpture terrace housing skylights, emergency stairs, fans, and chimneys, but each function’s envelope takes on an autonomously sculptural quality which has become a part of the building itself. A controversial building at the time, Casa Milà contributed greatly to Modernism as a whole, pushing formal boundaries of rectilinearity and significantly inspiring practices of biomimicry. A modernist building situated in Barcelona, Casa Batlló was originally built in 1877 by Emilio Sala Cortés, one of Gaudí’s architecture professors. 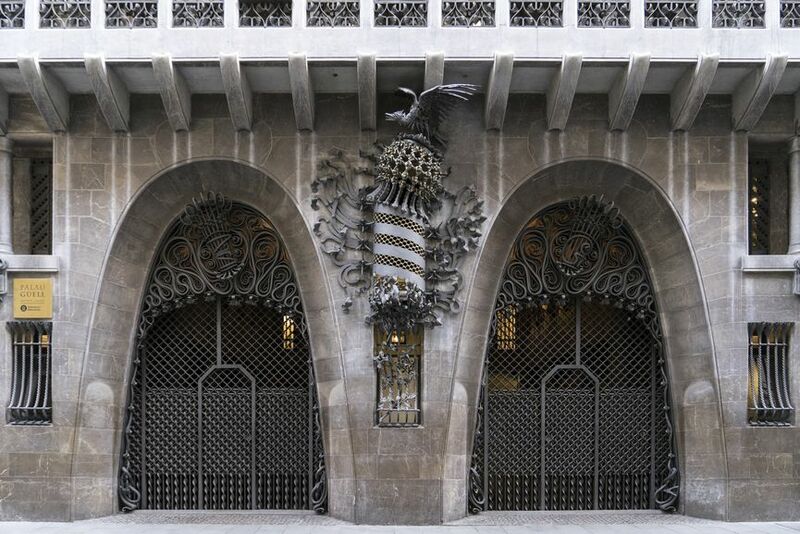 It was purchased in 1903 by Josep Batlló y Casanovas, a textile industrialist and a prominent businessman, who granted creative freedom to Gaudí, who fully reformed it between 1904 and 1906. Today, Casa Batlló is considered one of his masterpieces. The architect completely changed the facade of Casa Batlló, redistributing the internal partitioning, expanding the patio of lights and converting the inside into a true work of art. Locally called Casa dels ossos (House of Bones) for its visceral, skeletal organic quality, the building has a great artistic and functional value. Comprised of undulating lines, the facade is decorated with a mosaic made of broken ceramic tiles. The arched roof is likened to the back of a dragon or dinosaur. The ground floor of Casa Batlló features tracery, irregular oval windows and flowing sculpted stonework, while the noble floor, the main floor of the building, features skylights resembling tortoise shells and vaulted walls in curving shapes. The loft, one of the most unusual spaces in the building, is characterized by the simplicity of shapes and the Mediterranean influence. All painted white, it features a series of sixty catenary arches that forms a space which represents the ribcage of an animal. One of the most famous Gaudí’s buildings, the basilica La Sagrada Familia in Barcelona has been under construction for the past 137 years, since 1882, and hasn’t been completed until this day. At the time of Gaudí’s death, it was approximately a quarter finished. It is anticipated to be finished in 2026, on the 100-year anniversary of the architect’s death. Combining Gothic and curvilinear Art Nouveau forms, Gaudí designed a basilica characterized by a great complexity of parts, including double aisles, an ambulatory with a chevet of seven apsidal chapels, a multitude of steeples and three portals, each widely different in structure as well as ornament. Sagrada Familia has three grand facades, the Nativity façade to the East, the Passion façade to the West, and the Glory façade to the South, which remains to be completed. Having great religious and symbolic significance, the interior is surprising due to its magnitude, light and decor. Boris Hoppek Delivers the Last of 7ways2love in Barcelona!